What is this odd object? You are welcome! I am glad we were able to help. NIRERIN, thank you. Without you link and the illustration, I wouldn't have thought so. The contraption looks awkward, given that the lower tiers are narrower. If I've ever seen one filled with cups, I have no idea. Looks exactly like the K-cup spinner we have at work. It is the old style before they figured out that K cups sit and spin better with full circle support. Apparently it's technically called a carousel. It looks like a K-Cup rack to me. Maybe the little cups sit in the little dips. I've never seen anything like this. I really want to know what it is!!!! This thing is about 10" high and 8" in diameter (the top rack). The person who posted it indicated that it is made of stainless steel. Guesses so far have included mugs, hats, scarves, necklaces, shoes, fruits & vegetables. 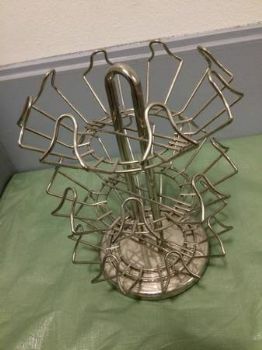 One suggestion is that it's a commercial cooking tool for baking a load of potatoes or something-or-other or that it's used to smoke something in a smoker. To hold wet sponges? None of the guesses, however reasonable, seem quite correct. Anyone here ever known one of these?